Surprising no one, Motorola will swap the original Droid phone with the Droid 2 on Thursday, when it launches on Verizon Wireless. The Droid 2 looks a lot like its predecessor and also has a 3.7-inch screen and 5-megapixel camera, but it gets a faster 1 GHz processor, a better physical keyboard with raised keys, 8GB of internal memory (with an 8GB MicroSD card instead of just a 16GB card) and the ability to become a Wi-Fi hotspot. To play up Droid's association with Star Wars -- Verizon licensed the name from Lucasfilm -- a special edition Droid 2 will launch in September. "The special version of the phone will feature exclusive Star Wars content and external hardware designed to look like the trusty Droid from the film saga," Verizon says. The carrier doesn't say how to get one or how much extra it will cost. Samsung's multi-carrier approach with the Galaxy S line has already produced two phones, T-Mobile's Vibrant and AT&T's Captivate. On Verizon, the Fascinate will have the same 4-inch screen, 1 GHz Cortex A8 processor, 5-megapixel camera and HD video capture, running Android 2.1. There's just no release date in sight. The Epic 4G from Sprint, also known as the Galaxy S Pro, adds a QWERTY keyboard, like the Droid 2, but also lacks details on pricing or availability. 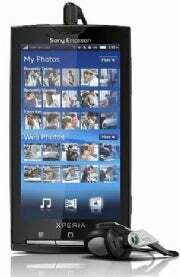 Sony Ericsson may be an obscure contender in the Android game, but the Xperia X10 brings modern specs such as a 1 GHz processor, an 8-megapixel camera and 8 GB of internal memory. The downside? Android 1.6 underneath Sony's custom interface, with an upgrade to Android 2.1 later this year. At least the asking price is $150 through AT&T -- $50 less than most of its Android peers - when the phone goes on sale August 15. The Droid 2 is not Motorola's final smartphone act for 2010, according to a rumored Verizon roadmap. The Droid Pro will reportedly launch in November, with a 4-inch screen, global roaming and -- most impressive of all -- a 1.3 GHz processor. Just as the original Droid's 600 MHz chip was soon outclassed, the Droid 2 could be upstaged by Motorola's next creation.